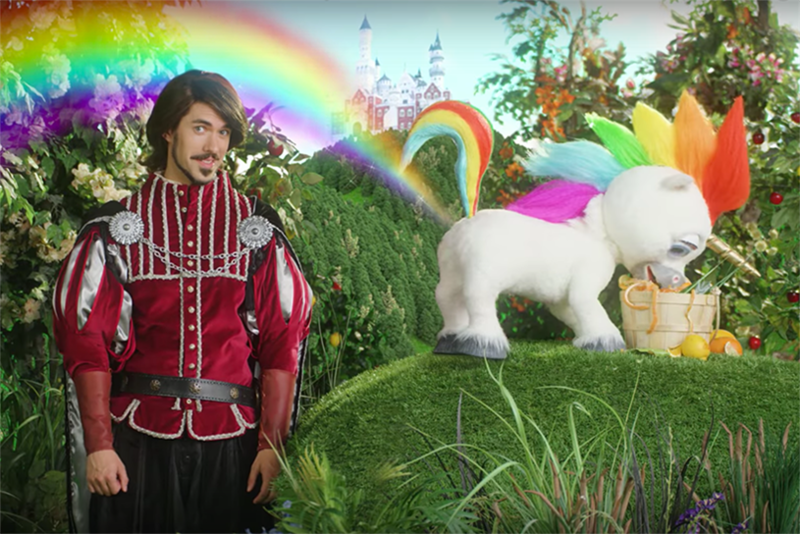 The prince and pooping unicorn return in a Harmon Brothers ad for a toilet spray product. Squatty Potty, the company known for its viral ad of a unicorn pooping soft serve ice cream, has produced a No. 2—a follow-up spot featuring the same characters, this time for a new product. The smooth-talking prince and poop-loving unicorn from the brand’s first ad, "This Unicorn Changed the Way I Poop" reappear in "Slay Your Poo-Stink with the Golden Fart of a Mystic Unicorn," created by Utah ad agency Harmon Brothers. The agency, also behind Squatty Potty’s first ad, premiered it at a red carpet event last night in Provo, Utah. The 3:30 spot promotes "Unicorn Gold," a line of toilet sprays that trap the stench of excrement under the water of a toilet using gold nanoparticles and essential oils. The sprays, priced around $10, come in poop-themed scents: "Tropical Dropsicle," "Mystic Forest," "Citrus Squeeze," "Fruity Booty" and "Pinch of Vanilla." In the spot, the prince describes his "e-poo-phany" about bottling unicorn farts in "Unicorn gold," while duchesses try out the new spray. "Each time a unicorn cuts the skittles, we bottle it at the source and send it to you. Beautiful? Yes. Like a Monet masterpiece, if Monet were a magic farting horse," proclaims the prince. Benton Crane, managing director at Harmon Brothers, said the agency used the same formula as the first viral video for the brand, created to promote the "Squatty Potty" toilet stool—"the stool for better stools." The goal was to educate about the biomechanics of pooping; the agency needed to convey to an audience that squatting is better for the colon. Needless to say, the subject of poop is hardly an easy one to sell. "We asked ourselves, ‘how can we make it okay to talk about this?’" said Crane. The agency settled on replacing poop with "delicious, desirable" ice cream, the "polar opposite" of poop, said Crane. Still, the agency couldn’t have the ice cream coming out of something real—that would be gross. "That’s why we entered this fairy tale land of the unicorn and prince," said Crane. "Unicorns were already an internet sensation, and it made it okay to have this conversation." While Squatty Potty CEO Bobby Edwards was on board with the unicorn idea, his investors, colleagues and Lori Grenier—who invested in the brand after an appearance on ABC’s "Shark Tank"—were not. "Initially, they hated the unicorn idea," said Crane, "but four months later they came back and wanted to do it. The CEO put his neck on the line." The gamble paid off. "This Unicorn Changed the Way I Poop" was viewed over 100 million times on Facebook and YouTube, and increased online sales by 600% and retail sales by 400%, according to Crane. It wasn’t the agency’s first time to place a brand on a royal throne. In 2013, PooPourri—a Texas-based company that sells a smell-reducing toilet spray similar to Squatty Potty’s new Unicor Gold—had a similar issue, and approached Harmon Brothers about creating a one-time viral campaign. The "Girls Don’t Poop" videos took off—shared over 2 million times on social media—and boosted web traffic for the brand by 13,000%, according to Crane. The agency no longer works with PooPourri, for whom Squatty Potty’s new spray is direct competition. Though Crane eagerly embraces his agency’s role as a master of poop-related videos, he says he is actually very selective about which clients he takes on because his team is largely Mormon. "We turn down 50 products for every product we accept," said Crane, including an offer from Anheuser-Busch. "For most advertisers," said Crane, "that is a dream come true, because beer commercials tend to be the most fun. But our team looked at it, and said, ‘Oh man, this is Anheuser-Busch and they are flashing some big budgets towards us, but we are Mormons and can’t enjoy beer, so we would be lousy." The agency also doesn’t bank on virality. "When we build our campaigns," he said, "we never plan on them going viral. We build our campaigns with the intent to make a campaign that converts, where you go, ‘Wow, I want to buy this product.’"
That said, Crane is certainly hoping that "Squatty Potty 2" will be as popular as the original. "You can look across all the Hollywood movies out there," said Crane, "and it’s pretty rare to find a sequel that is better than the original. There’s not a ton of them. And in the advertising world, there are even fewer." He pointed to Wieden+Kennedy’s Old Spice commercials as an example. "They had a mega-hit on their hands, and they tried to follow it up with sequels, but they always fell flat compared to the original." What will make the video successful, said Crane, is if consumers buy the product and purge their bathrooms of the poop smell.